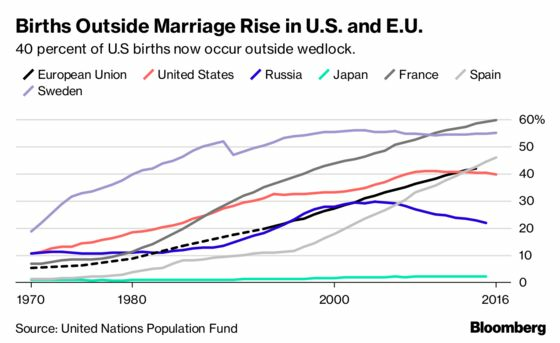 (Bloomberg) -- An increasing number of births happen outside of marriage, signaling cultural and economic shifts that are here to stay, according to a new report from the United Nations. The EU likely sees more births out of wedlock because many member countries have welfare systems that support gender-balanced child care, said Michael Hermann, UNFPA's senior adviser on economics and demography, in an interview. Public health care systems, paid paternal leave, early education programs and tax incentives give unwed parents support beyond what a partner can provide. The data show such births in the U.S. and EU are predominantly to unmarried couples living together rather than to single mothers, the report says. The data suggest that societal and religious norms about marriage, childbearing and women in the workforce have changed, said Kelly Jones, the director for the Center on the Economics of Reproductive Health at the Institute for Women’s Policy Research. The average age an American woman has her first child is now 27, up from 22 in 1970. As the marriage rate has fallen in the U.S.—and those who do tie the knot do so later in life—the number of adults in cohabiting relationships has steadily risen. This shift is most evident among those under age 35, who represent half of all cohabiting couples, however the rise in cohabitation is occurring across all age demographics.